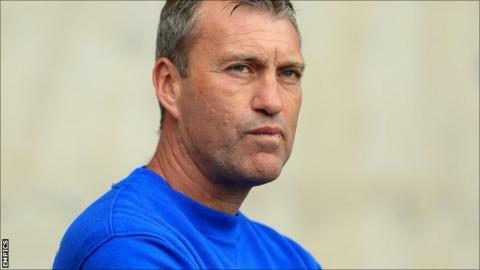 Peter Shirtliff believes the uncertainty surrounding the managerial position at Bury may have contributed to the club's poor start in League One. on the eve of the campaign, leaving Shirtliff in caretaker charge, but the Shakers have failed to win a game under him. "It's always a difficult scenario," Shirtliff told BBC Radio Manchester. "It's a no-win situation. We've had a tough start. We've got two points from five games, which is not good enough." Shirtliff continued: "If I'd got four wins out of five games, everybody would be saying 'give him the job'. "What's concerning me is that we've conceded two goals in four games on the spin. We've got to keep it tight in our defensive department and we're not doing that at the moment." Speaking to BBC Radio Manchester on the opening day of the league season, Bury director Mark Catlin said Shirtliff would be given a chance to prove he had the right credentials for the job. Shirtliff, who has stated he expects a decision on Barker's successor to be made in the near future. "I haven't had a discussion about it but I would imagine they'll be starting the interview process this week," he added.